London 25th July 2016 – Today BuzzMyVideos has released the results of its bi-annual online video barometer which surveys the opinions of 500 18-35 year olds on developments in online video consumption. 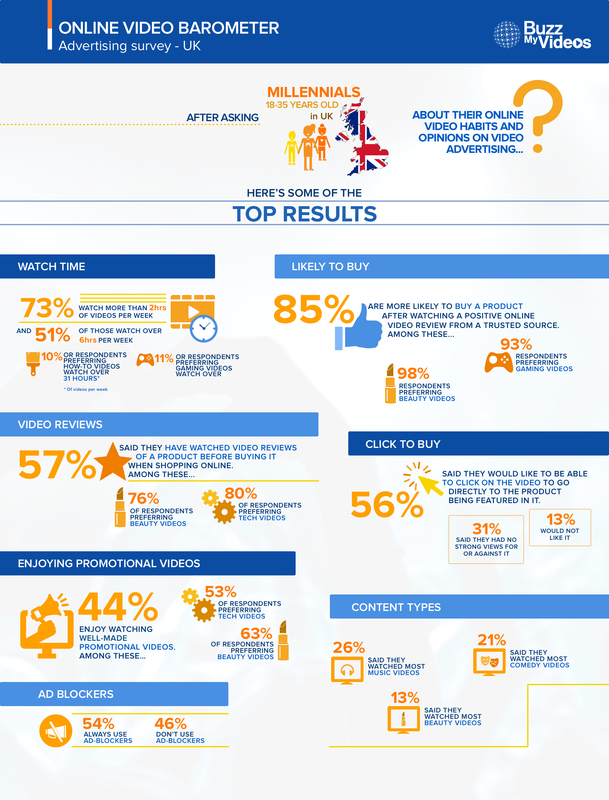 The July 2016 survey has revealed that a staggering 85% of UK millennials asked are more likely to buy a product that has an online video review from a trusted source, while over half of those asked (57%) said they enjoyed watching a full video experience to show them about products before committing to buy. The results will make interesting reading for brands that have not adopted an online video strategy yet while simultaneously confirming the success of those who have already chosen this channel to address Generation Y. Today this population segment includes 15 million Britons (Source: ONS), who were born between 1980 and the end of 1994 – almost a quarter of the entire UK population. A population which is about to move into its prime spending years, reshaping the economy and the way brands communicate with their audience. As the first generation of digital natives with a high affinity for technology, Millennials have the ability to stay social and connected 24/7, the majority spending their time watching on-demand video content based on their interests, rather than passively watching TV shows. The results will come as little surprise to the brands already adopting an online video strategy. The survey, conducted independently by OnePoll, showed nearly a third of millennials (31%) now watch between 6 and 20 hours of online video every week, with over half watching more than 6 hours per week. Men watched on average more online video than women (7 hours compared to 5 hours per week) with gaming and how-to videos garnering the most time spent watching per week with 11% and 10% of those asked watching more than 31 hours every week respectively. YouTubers are still the most trusted source when it comes to the advertising world, with over a third of respondents (36%) saying they would trust a YouTube review of a product over any other media; followed by 31% placing their trust in a magazine review. Just 18% of millennials are inclined to trust reviews they see on the television, reflecting the monumental shift in advertising budgets from traditional TV across to online video at record pace. Global advertising expenditure is set to hit $579 billion this year. Internet advertising accounted for 29.9% of global ad expenditure in 2015, and is expected to reach 38.4% of all global advertising by 2018. Online video and social media are the mediums pushing the growth with 20% and 24% predicted year on average growth between 2015-2018, according to ZenithOptimedia’s recent report. Nearly half of all those surveyed said they enjoyed watching well made promotional videos (44%), not seeing advertising as intrusive to their viewing experience but in fact enhancing their overall enjoyment of online video content. Regarding the use of adblockers for online video, it appeared very much content dependent with 54% of 18-35 year olds having at some time used ad blockers for online video and just 20% saying they always use them. 46% of the respondents do not use an adblocker on video at all. When asked about the most acceptable forms of advertising in online video the response was clear: 50% felt that a YouTuber using (28.2%) or reviewing (21.8%) a sponsored product was the most accepted form of advertising, followed by the implementation of traditional banner ads (32%). 86% of those surveyed said they would like to be able to click straight through to a product seen on a video that they are interested in, or they had no strong views for or against it. In fact more than half (56%) were strongly in favour of being able to click straight through to a product from the online video, signalling this feature as a highly desirable next step for online advertisers to engage their customers. In terms of subjects watched, 26% of those surveyed watched music videos, closely followed by comedy 21% and then beauty 13% with those watching beauty and tech videos expressing huge enjoyment in watching promotional videos on their topic (63% and 53% respectively).